(NaturalNews) Less than 24 hours after the Food Babe launched a petition demanding beer companies publicly disclose their ingredients (yes, beer ingredients are a long-kept secret and they are not required by the FDA to disclose them), the MillerCoors company has been caught deceiving the public over its use of corn syrup derived from genetically modified corn. Click here to listen to the full interview between the Health Ranger and the Food Babe, where this breaking news is revealed. Bowing to public pressure spearheaded by the Food Babe and her "Food Baby Army" of ready activists, MillerCoors publicly posted what it claimed to be an "ingredients list" for its products such as Coors Lite, Miller Lite, Miller High Life and other beers. The ingredients claimed for these items included simple, natural-sounding ingredients like water, barley malt, corn, yeast and hops. But Natural News has learned the MillerCoors company gave a different answer when asked the same question via email, listing "corn syrup" as one of its key ingredients. As you can see from this email, the ingredients list first given out by MillerCoors was, "Water, Malted Barley, Corn Syrup, Hops, and Yeast." The email from MillerCoors even described the use of corn syrup, saying "Corn syrup gives beer a milder and lighter-bodied flavor." But when pressed with a powerful activism campaign to publicly disclose all its ingredients, suddenly the "corn syrup" got transformed into "corn" on the MillerCoors Facebook page. What gives? Corn is not the same as corn syrup. So why is MillerCoors now fudging this fact in its so-called "public disclosure" of ingredients? Is the company embarrassed to admit it's using corn syrup, an ingredient linked to diabetes and obesity? Keep in mind that if any food company lied on their ingredients label and listed "corn" instead of "corn syrup," they could be heavily fined by the FDA and shut down by the regulatory agency. Their products could even be seized and the company could be accused of "fraudulent mislabeling" of their products. 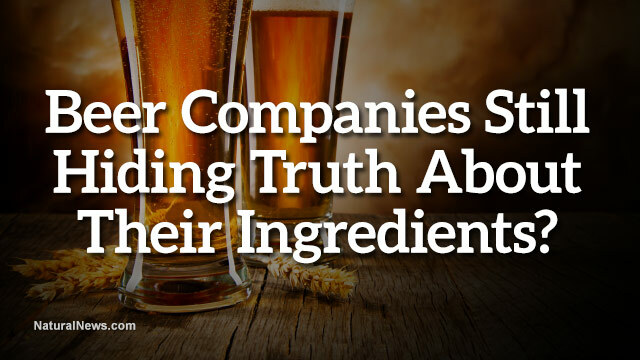 So why does the MillerCoors company think it is exempt from telling the truth about its ingredients? Does the company think we're all too drunk to notice the difference between corn and corn syrup? Uh... corn comes on a cob. Corn syrup comes in a bottle and flows like syrup. They are not the same thing and they have completely different health effects on the human body. Nearly all corn syrup comes from genetically modified corn, or GMOs. If you drink beer products from MillerCoors, are you drinking GMOs? I asked the Food Babe this very question in a recorded interview available on YouTube. She replied, "I got an email confirmation from Miller-Coors after several exchanges that says they are using biotech corn." So MillerCoors is using genetically modified corn after all, which means when you buy MillerCoors beer, you are financially supporting Monsanto, the most-hated corporation in the world, considered to be the single most evil commercial entity on the planet by a great many people. When I think about what I support and what I buy, biotech corn is not one of the things I want to support. So you won't see me buying any Miller-Coors products, and I encourage other people not to as well. Because the same way I boycott Kraft, General Mills... all the companies that are in bed with Monsanto and are spending loads of money against our right to know, and against our human right to know what's in our food, I think we really need to put our money with our mouth is, because that's the only way we are going to change the world when it comes to what's being served to us. Hey MillerCoors, what the #%@! are you serving us, anyway? Natural News now joins the effort to ask MillerCoors what they're really putting in their beer products. And no, claiming it's a "proprietary trade secret" isn't gonna cut it. We the People of America deserve to know what we're drinking. We deserve honest labeling so that we can make a choice about what we choose to buy and consume. Any corporation that tries to tell us we don't have the right to know -- or tries to pull the wool over our eyes -- should be immediately boycotted. The age of "secret ingredients" in our food and beverages is over and done with. We are in the age of social-media-connected activism, and it turns out that everybody wants to know what they're drinking, eating, swallowing or even taking as medicine! 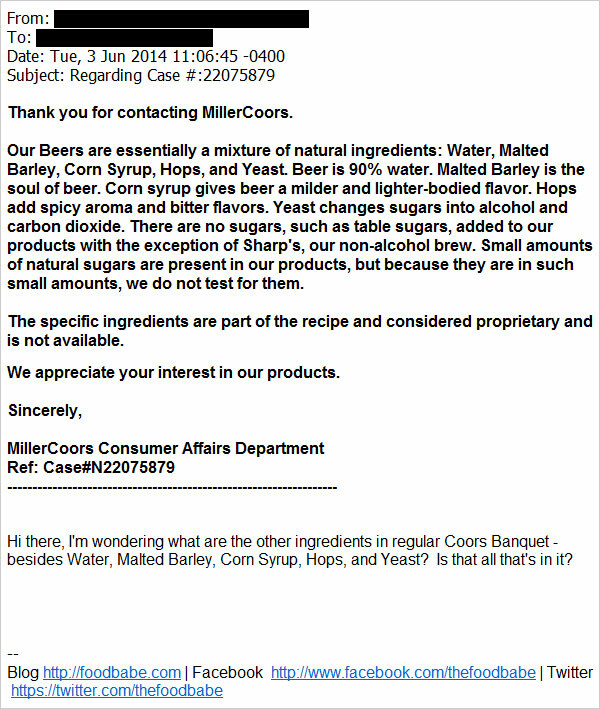 You may have also noticed in the email shown above that MillerCoors continues to claim it doesn't have to disclose ALL the ingredients it uses, claiming "The specific ingredients are part of the recipe and considered proprietary and is not available." That's no longer acceptable! If it's a food, beverage or even a cosmetic product, We the People have the right to know what's in it! Consider how arrogant it is for companies to say, essentially, "Here, EAT this food or DRINK this beer, but we're not gonna even tell you what's in it! SUCKA!" That's the attitude we get from these beer companies. And it's an attitude that's going to put them right out of business if they don't come clean. Because consumers always have a choice. And when it comes down to a choice between "mystery ingredients" in a beer made from GMOs vs. an honest organic beer marketed with full disclosure, most people are going to choose the honest organic beer! Personally, I don't drink beer, so I never paid any attention to the ingredients of beer. But I'm glad the Food Babe's husband drinks beer because that put all this on the national radar. Now we must all join together and demand honest beer ingredients from companies like MillerCoors and Annheuser-Busch. After all, these companies are really part of the American culture in many ways. Don't Americans deserve to know what that culture is really made of? Or do these beer companies prefer to operate like the NSA and claim their secrets are more important than your right to know?